The way you implement LIFE’s PDCA in your life is the same as you would implement Deming’s PDCA in a manufacturing process. For example, I’ve done this to improve my speaking ability in front of people. I was very shy and so scared to talk to strangers, let alone talk to a crowd. I’ve done it before when I had no choice for a job, and I was like Ben Stein’s character on the wonder years (very boring monotone voice). I defined the problem: I can’t speak well and I put people to sleep. I’m really nervous. I measured the current data: People didn’t listen to what I said; I had no self confidence when I talked; and I talked like a dweeb, sounding like a geek with no people skills. There is nothing wrong being a geek, but you run into problems when you talk like one and/or annoy people from constantly saying things they don’t care about. I was scared to go up to a stranger and start talking (or answer their questions with more than a one word answer). I was very scared of crowds. I was scared of looking like a fool. Analyze the data: I had no people skills when it came to talking (I was only good at listening). I had no self confidence due to the lack of knowledge and skills when it came to talking. I was not doing anything to get any better, only thinking about how bad I was, reinforcing my low self confidence. Improve: I read a few books to raise me knowledge and skill level. I read stuff like ‘How to Win Friends and Influence People’ by Dale Carnegie, ‘How to Have Confidence and Power in Dealing With People‘ by Les Giblin, and ‘Personality Plus’ by Florence Littauer. I also went through LIFE’s Public Speaking pack about 10 times by now. I then went out and started talking to strangers, knowing that action conquers fear. I’ve spoken more and more in front of groups, from doing a short training session, to showing longer business plans. I’ve gotten good results. Although I’m nervous talking to stranger or to groups, the fear doesn’t get in the way anymore. My presentations have gotten better and better, where people laugh at my jokes instead of at me. I now sound credible instead of someone with no self confidence that is not worth paying attention to. Control: By subscribing to the LIFE and LLR subscriptions, I am constantly improving my leadership and relationship skills, thus raising my self confidence. I continually go out and talk to people knowing that if I don’t, the fear might slip back in; knowing that the more I go out and deliberately practice the skills, the more they will improve. I apply the slight edge philosophy into this; doing the small and easy things every day to improve, that are also easy not to do. It was actually learning all the concepts with LIFE’s teachings first, that allowed me to excel in project. If you’re curious about what the project was, it was reducing errors the planning department makes causing parts to be ordered too late. I brought it from 178 in the first 2 months down to 9.1 in the last two months. It lasted about a year (yes, I know, very long for a green belt project!). What areas in your life are you looking to improve? Is it in your finances? Your family? Your fitness? Your Freedom? Your Friendships? 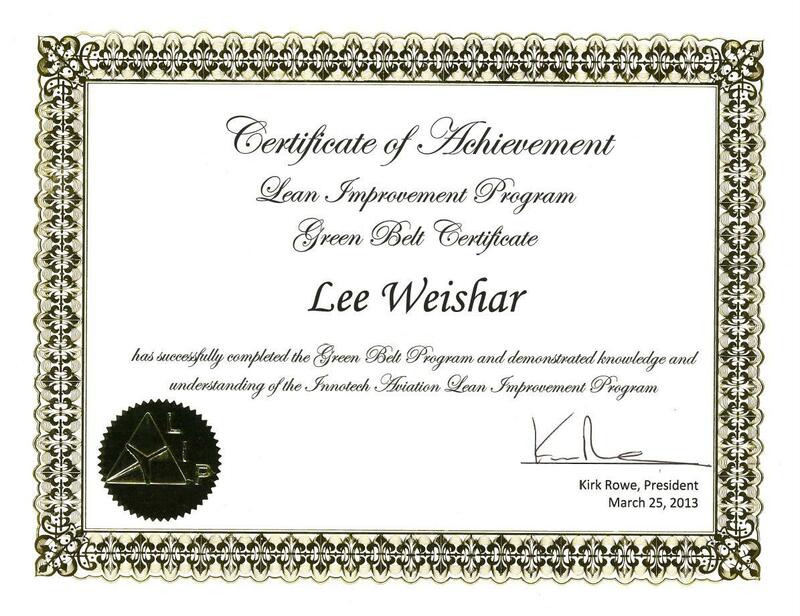 Apply the PDCA process, and become a green belt in LIFE!